We listed up our recommendations for you ! 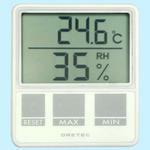 MonotaRO offers Braun thermometer and more. You can buy them anytime from our Malaysia online store. Accessories: 006P (9V) battery x1, instruction manual, with vinyl cover, 006P (9V) electric battery x1, instruction manual,with vinyl cover attached, Weight (g): About 157, About 157 , Power: 006P (9V) 1 piece battery, 006P (9V) 1 electric batteries, Measurment Range (deg C): -30-550, -30 - 550, Display: 3.5-digit LCD display, 3.5 digit LCD display, Measurement Pricision: +/- 2% larger rdg or +/- 3 ℃, +/-2%rdg or +/-3degreeC, whichever is higher, Dimensions (Width W x Height H x Depth D) (mm): 148x105x42, 148x105x42, Resolution (deg C): 0.5 / 1 (automatic switching), 0.5 / 1 (Auto switching), Sampling: 4 times / sec, About 4 times/second, Operating Temperature and Humidity Range: 0-50 ℃ 70% RH or less, less than 050deg C 70%RH, Storage Temperature/Humidity Range: -20-60 ℃ 80% RH or less, less than -2060deg C 80%RH, Emissivity Settings: 0.95 fixed, 0.95 fixed, Measuring Area Dimensions: phi100mm in 1000mm, phi100mm at 1000mm, Type of display Temperature: Digital, Thermometer Type: Radiation thermometer (cancer type), Caution: Do not look in to laser light Do not point laser on human Keep out of reach of children., Do not look in to laser light Do not point laser on human Keep out of reach of children., Do not look in to laser light Do not point laser on human Keep out of reach of children., Do not look in to laser light Do not point laser on human Keep out of reach of children. See more results of "Braun thermometer"
Bimetal Thermometer for Soil Temperature and Thermometer for Soil Temperature and other recommendations.